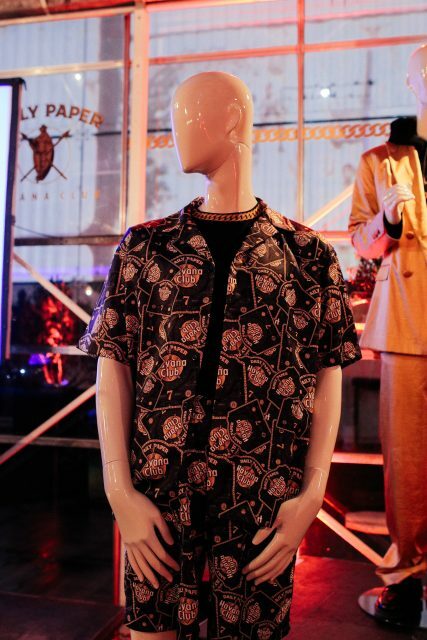 Cuban rum brand Havana Club launched a clothing range in partnership with fashion brand Daily Paper, marking its launch with a catwalk event of the collection, complete with DJ set and signature cocktails, in Antwerp. The eight-piece black and gold themed capsule collection, inspired by the “gold chain” of street culture, includes a t-shirt, hoodie and hip flask, all of which are available on the DailyPaper website. Its launch coincides with the release of a limited edition Havana Club 7 Años bottle, co-designed with Daily Paper and featuring a unique Daily Paper x Havana Club logo, is available on the Monar, Dranken Bouique and Drinks and Co websites at the RRP of €40. The collaboration celebrates “the authenticity, tradition and eclecticism of each brand – blending the rich heritage of Havana Club with the modern aesthetic of Daily Paper”. Ludmilla Stephkov, brand director design at Havana Club International, said: “It is incredibly exciting to finally unveil the Havana Club x Daily Paper capsule collection to the world – it marks the start of the next chapter for Havana Club as we look to lead the rum revolution and recruit the rum drinkers of tomorrow. As part of the partnership, Havana Club and Daily Paper have also introduced the Cuban Links contest, again inspired by gold chains, to support emerging creative talent. Three winners from the fields of design, photography and music will be flown to Havana, Cuba and mentored by Havana Club, Daily Paper and other industry leaders during a week-long creative workshop, where they will produce new apparel pieces and a media campaign to finalise and promote the Havana Club x Daily Paper collection around the world.